What is the "HELP_FILE" Cryptowall v4.0 virus? If you have discovered that all your files are missing or they have renamed with random characters, like "e9fgbb.ie0r", "52lcvn.ifggh" "d3uhgfds.gre8v", etc. and all your documents, pictures and desktop folders are full of HTML and PNG files with random filenames like "HELP_FILE_4BAACA128.PNG", "HELP_FILE_4BAACA128.HTML", etc. then, unfortunately, you have infected with the latest version of Cryptowall version 4.0 virus (Trojan-Ransom:Win32/Crowti-b). The Cryptowall version 4.0 virus, is the latest version of Cryptowall family virus and upon infects your computer, encrypts all your important files with strong encryption and is impossible to decrypt them unless you pay the ransom. Compared to older version the new Cryptowall v4.0 ransomware virus, also encrypts the filenames, changes the name of your files to random characters and finally deletes the Volume Shadow Copies. At the end of Cryptowall Version 4.0 infection, you receive a ransom demand message informing you that your files (documents, photos, videos, etc) are encrypted with a strong encryption and in order to decrypt them and get your encrypted files back, you have to pay the ransom by following the directions given inside the HELP_FILE .PNG and .HTML files.
" Cannot you find the files you need? Is the content of the files that you have watched not readable? It is normal because the files' names, as well as the data in your files have been encrypted. Congratulations!!! You have become a part of large community CryptoWall. If you are reading this text that means that the software CryptoWall has removed from your computer…..
Encryption is a reversible transformation of information in order to conceal it from unauthorized persons but providing at the same time access to it for authorized users. To become an authorized user and make the process truly reversible i.e. to be able to decrypt your files you need to have a special private key. In addition to the private key you need the decryption software with which you can decrypt your files and return everything in its place. The first thing you should do is to read the instructions to the end….."
Many users (on the Internet) complained that their files remained encrypted even after they paid the ransom, so it’s your own decision (and risk) to pay (or not) the ransom and to support (or not) the criminals. In this article you can find detailed instructions on how to remove the new HELP_FILE – Cryptowall v4.0 virus from your computer. Keep in mind that your files will be remain encrypted after the virus removal. How to restore (decrypt) Cryptowall v4.0 encrypted files? 1. To copy your files back from a clean backup. 2. To restore the encrypted files by using Shadow copies, if you are too lucky and the virus doesn't have deleted the Shadow Volume copies yet. 3. To pay the ransom and decrypt your files (I DON'T SUGGEST IT). How to remove the Cryptowall v4.0 (Crowti-b) ransomware virus-trojan infection? Step 1. Start your computer in Safe Mode with Networking. 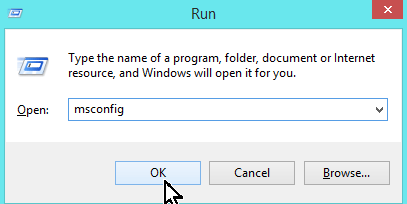 Type msconfig & press OK. Select the Safe Boot & Network options & click OK. Step 2. Terminate and remove Cryptowall infection with RogueKiller. Step 3: Remove Cryptowall version 4.0 malware infection with MalwareBytes Anti-Malware. Step 4. Scan your system with Eset Online Scanner. 2. Accept the license terms and click Start. a. Check the Enable detection of potentially unwanted applications. b. Check all the options under "advanced settings". (see screenshot below). c. Press the Start button to scan and remove viruses and malware programs from your computer. 4. Be patient until the ESET online scanner removes all threats found.